Talk to me, Tivo: Michael unintentionally outs a gay employee; the situation with Jim and Pam. Jam Cam: It’s so nice to be back in The Office after four months. It’s not so nice seeing Dwight clipping his fingernails at his desk and blowing them towards Ji…OH MY GOD! What is Ryan doing at Jim’s desk? This is not good. Ryan has Jim’s job because Jim went to Stamford? Nooooooo! Pam is looking weepily at Jim’s old desk and — woah! Flashback! It’s Jim and Pam kissing at Jim’s desk on Casino Night and as they pull away, Pam slips her hands into Jim’s. Jim smiles. “You have no idea how long I wanted to do that.” Me too, Pam says. She wanted to kiss him too! Pam thinks they may have just kissed because they were drunk. Jim says he isn’t, Pam says she isn’t, and with a smile coming over Jim’s lips, he leans in to kiss her again. 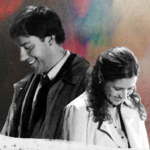 “Jim…” What are you doing, Pam? Don’t stop him from kissing you! Jim knows why she stopped him, but he just wants to make sure. She’s going to marry Roy, isn’t she? Pam nods. Jim put his cards on the table, he’s lost and he knows it, but at least he tried. “Ok,” he says in a way that sounds almost as if he’s accepted this outcome. Jim backs slowly away from Pam, her hands slipping from his. So Jim’s gone and we’re all crying and broken hearted. Dwight seems really upset too. He’s sad, he misses Jim, he cries himself to sleep. “False. I do not miss Jim.” Oh well, at least some things have stayed the same. In Stamford, things look different. Jim’s desk is nice, he’s dressed better, he’s doing actual work trying to convince someone that Dunder-Mifflin’s paper isn’t more flammable than the competitors. Jim thinks it’s pretty obvious why he transferred — he got a promotion. Really, Jim? That’s the excuse you’re going to go with? In addition to the new suit, Jim seems to have picked up a new nickname: Big Tuna. Stamford Sales Guy Andy asks Jim if he’s single and then makes sure he knows to steer clear of the apparently crazy lady in their office. But why Big Tuna? Jim really does seem to be making alot of changes — new office, new suit, and new sandwich choice with his tuna salad. Wow. You know things are different when Jim isn’t eating ham and cheese anymore. But just when you think Big Tuna has gotten away from it all, he gets sucked right back in. In this case, it’s going to be a refresher course on diversity because of an incident in the Scranton branch. Oh, and some cold calls need to be made so Jim volunteers to take them on. Nice job, Jim! Wait, who are this woman and why is she talking about our Jim like that? He’s nice enough? He makes weird faces at the camera? I don’t know who you are, but I already don’t like you. No one gets away with making fun of our Jim! Meanwhile, Michael and Dwight are back in Scranton trying to figure out who in the office is gay. Dwight seems to remember Jim talking about buying gaydar online. Maybe they should call him and ask about it. “Gaydar? Oh, gaydar!” Jim happily responds. Bang, bang, bang on his keyboard shows that Sharper Image is sold out. Bummer. Jim hangs up the phone, gives a quick glance to the camera and mutters “I miss that.” We do too, Jim, and we’re not even halfway through the first episode of the season. Ick, Roy’s in to visit Pam. Wait a minute…Roy isn’t looking so bad. He’s got a little bit of a beard and lost some weight. Maybe finally getting married was good for him. “Chicken or fish?” he asks Pam while holding two plates. He brought her lunch? Wow, how nice. Pam asks for the chicken in a very quiet and cold way. Huh. This conversation is getting weird with Roy asking how her day is going and Pam’s lukewarm “Excellent,” for an answer. What an awkward conversation between two people who are marri….OH MY GOD! There isn’t a ring on Pam’s finger. YES! Pam says she decided a few days before the wedding that she needed to cancel it, that she needed to get out of that relationship. So she moved into her own apartment and started taking art classes — the ones Jim had once encouraged her to take. Squee! And Roy hit bottom, was arrested for drunk driving, and, to add insult to injury, had a really ugly mug shot taken. But Roy has realized — finally! — that he needs Pam and he’s going to win her back. Please don’t do that with Jim gone. Not fair! Meanwhile, Andy is trying to get some work done in Stamford and needs his calculator, which has been suspended in Jell-o. Nice. Jim is smirking behind his computer monitor while Andy starts to get a little testy about the calculator. Really testy. He needs to know who did this or he’s going to lose his frickin’ mind and kick a trash can. What? Jim’s face goes from a funny smirk to a look of horror. Man, Andy is so much less fun than Dwight. But some things seem to stay the same as Michael has a conference room meeting to out Oscar. In the process, he reminds all ouf us that we’re homo…sapiens. Pam finds this hysterical and looks over to Jim to share a good laugh with him. Except Jim is now Ryan and Ryan finds Pam looking at him really weird. Things get worse as Michael goes in to plant a big one on Oscar. Without Jim around, it’s all about looking to the camera now to get some support. Jim would have so loved to see all of that. Instead, Jim’s sitting in a conference room in Stamford listening to diversity training — again — and giving a slight smile when he looks over at the empty seat next to him. The last time he had to go through this, the empty seat was filled by a sleepy Pam with her head on his shoulder. That was a good day. But of course, we can’t get through an episode without a Jim prank. Dwight opens a box with a note from Jim and Pam perks up hearing his name. It’s a Gaydar that seems to know that Oscar is indeed gay. Oh wait, it thinks Dwight is too. Pam leans over her desk and smiles, then looks a little sad. The pranks just aren’t as funny without Jim there. The Others: Michael seems to have called the wrong person “faggy” — namely a gay guy in the office. Toby tells Michael that Oscar was offended by his remark because Oscar is the gay guy in question. Why did you tell Michael a secret like that? Bad idea. Oscar gets outed to everyone by Michael and then has to share a really awkward kiss with his boss. Later, Michael wonders if Oscar’s roommate Gil knows that he’s gay. Umm… At least Oscar gets three months paid vacation and a company car out of the whole ordeal. What have we learned today, kids: Sometimes distance does make the heart grow fonder, especially after you cancel your wedding. Just because the sales guy takes a transfer to an office three hours away doesn’t mean you can easily forget him — or he can easily forget you. Jim: You have no idea…how long I wanted to do that. Pam: Me too…I think we’re just drunk. Jim: No, I’m not drunk. Are you drunk? Jim: You’re really going to marry him? Andy: Hey, Big Tuna. You�re single, right? Jim: Mm hm. Yeah, I am. Andy [motions to woman in kitchen]: Pretty hot, huh? She�s completely crazy. Steer clear, Big Tuna. Head for open waters. Jim: I ate a tuna sandwich on my first day so Andy started calling me Big Tuna. I don’t think any of them actually know my real name. Jim [on the phone]: What�s gaydar? Oh oh, gaydar! Yes! No…uh…I think they have it over at Sharper Image. Oh, you know what? I can check for you. No problem. [bangs on his keyboard] It�s sold out. Yeah, sorry about that. That�s a bummer. Michael [in his office]: They�re sold out. Dwight: Damn. I�ll try Brookstone. Jim [at his desk]: I miss that. Roy : So you having a good day? Roy : Good, I�m glad. Ok.
Pam: Yeah, I didn�t go through with the wedding. I got cold feet a few days before. I can�t really explain it. I just had to get out of that relationship. We still had to pay for all the food so we froze it. But I�m…I�m doing well. I have my own apartment and I�m taking art classes…and I have lunch for the next five weeks. Andy: Ok, who put my calculator in Jell-o? [Andy looks around and Jim smiles] Good one. But…uh…seriously, guys, who did this? [getting upset] Seriously, guys. Who did this? I need to know who put my calculator in Jell-o or I�m gonna lose my freakin’ mind! [Andy kicks a trash van and Jim’s face goes from a smile to a look of fear] [In the conference room, Michael makes a joke and Pam instinctively turns to her right to share a laugh with Jim, who has been replaced by Ryan] Ryan: What?